The architects did, however, hold on to their original pinwheel plan, with production wings rotating around a communal courtyard. 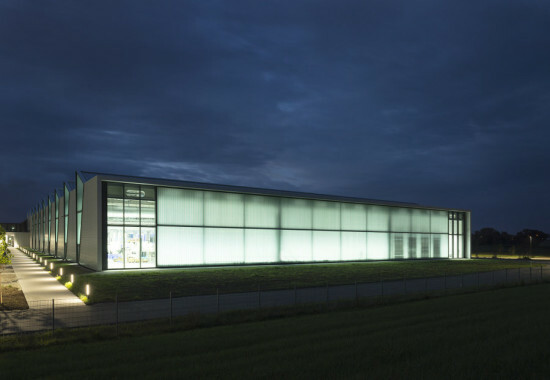 Inspired by Le Corbusier‘s “green factory”—a humanizing alternative to the “black factories” of the nineteenth century, which prioritized the flow of goods over the experience of the workers—Barkow Leibinger’s design opens the HAWE plant to the Bavarian countryside with a geometric facade of corrugated metal and glass. Steel-framed shed roofs sit atop the concrete. 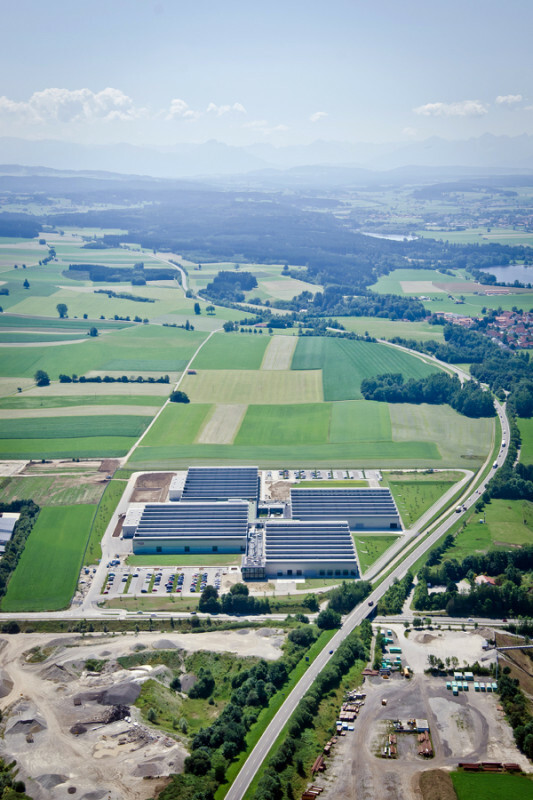 Skylights look to the north, while the roof’s south slopes are designed to accommodate photovoltaic panels. “The north-facing shed is a classical industrial solution,” noted Barkow. “It brings in a lot of light, and saves a lot on artificial lighting.” The arrangement of solids and voids on the facade emphasizes the resulting sawtooth profile. 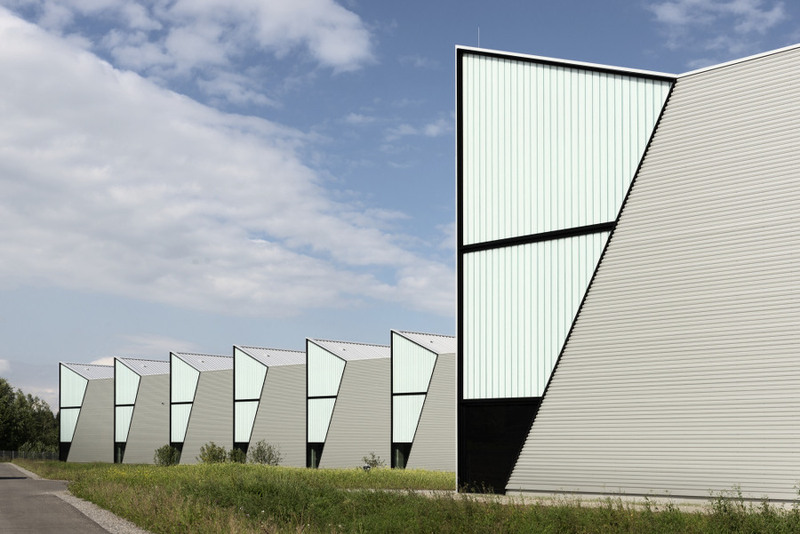 The architects carved the envelope into a repeating pattern of triangles and trapezoids, clad in glass and corrugated sheet metal, respectively. Most of the building’s glazed surface is translucent white channel glass, with vision glass in the sliver of space closest to the ground. At the end of each wing, a broad horizontal window features a larger central section of channel glass framed by floor-to-ceiling panels of transparent glass to either side. “This is a kind of Corbusian idea: large end facades that look into the countryside,” said Barkow. 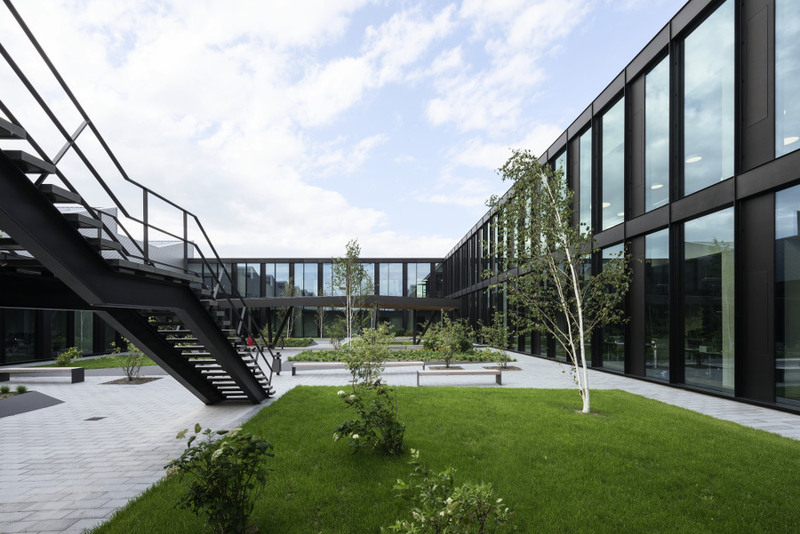 The factory wings are designed to be expansible, the end facade deconstructed and then rebuilt after the installation of additional bays.